Everybody clear the kitchen! I’m in a cooking mood and just planned a tempting menu. About once a year, I get inspired to make a really nice meal just because. Not that often, I realize, but there is a reason for that. It’s a lot of work and I make a huge mess. 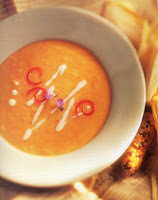 The foods aren’t difficult but become a creation, a work of love, and a gift to the recipients. I don’t have a guest list yet, but I believe I’ll just ask one other couple over so it can be an intimate evening of indulgence and good company. Everything can be made ahead so it won’t be difficult for the hosts to enjoy. Most of the recipes come from one of my favorite cookbooks, the Junior League of Houston’s Stop and Smell the Rosemary. Mango Margaritas Lining the glass with coarse colored sugar that you get for Mardi Gras King Cakes makes these drinks quite festive. Rather than use fresh mangoes, the ones in the jar really seem to be sweeter for this summer refresher. Corn, Red Pepper, and Leek soup with Parmesan crostini The reason I chose this recipe is we have quite a crop of leeks this year, though this recipe only uses a couple. The flavors sound complex but I haven’t made it before. Brave, huh? I love an adventure. Radicchio, Watercress, and Arugula Salad Simply green and delicious, serve at room temperature to capture all of its flavor. Chicken and Spinach crepes with mushroom sauce -Okay, this one is complicated, but you can make the crepes or buy them ahead of time, and assemble them together the day before the dinner party. 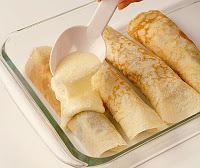 The mushroom sauce is best to make just before and pour over the crepes to give them a mouth-watering (calorie laden) finish. Sautéed asparagus and snap peas This recipe is so easy and can be last minute, so it gets my vote for a simple side. Kahlua ice cream and berries with toasted walnuts –What else do you need to top off a rich meal than a light dish of your favorite vanilla ice cream, with a splash of Kahlua and whatever berries are in season, garnished with toasted walnuts? I’m saving room for for this easy dessert. Coffee –my daughter brought us some beans back from Costa Rica so we’ll serve this in the evening for a robust flavor to finish the meal. Who wants to come for dinner next Saturday? Bring some flowers for the table and we’ll be set. Wouldn’t it be fun if we could! Hey, I’m close, I’d love to come! Sounds delicious and I just may try some of these recipes myself. Still considering the Siesta Fiesta this summer, I’m going to stay with Brian & Ashlynn. I asked my sweet daughter in law if she would like to go too, she said it sounded good to her. What better 40th b-day present could I get then my d-i-l and some Beth Moore!!! It all sounds delicious. I’d love to come. Maybe one of these days, friend. What a wonderful menu!!!! !I’m certainly in the mood for a party! Thanks Annie for the invite…..
Oh, Annie, count me in. I’ll even bring an “offering”. Sounds lovely. Sounds wonderful!!! I hope the evening was great! Everything sounds scrumptious! You’ve obviously had some fun thinking about and planning this meal – I hope the actual evening with friends is just as much fun! Be sure to take pictures so we all can see! Its only 8am but your making me very hungry. Great menu! Wow! What a dinner. My husband does most of the cooking, he loves to cook…but like you, every once in a while I get inspired and do dinner in a big way. Enjoy. Okay, we just ate dinner but this sounds absolutely delicious! I was thinking about some Baileys, too? Let me know if you need anything else! What time should we be there? Count me in!! Sounds divine! My mouth is watering. I’ll certainly bring fresh flowers – lots of them. Isn’t is wonderful that we get these creative urges? Today, I baked chocolate chip cookies and made some squash soup. They are old favourites, but it’s raining and I needed comfort food.